Do you love to lose yourself in a good film or book? Well, why not let fiction inspire the real-life place you escape to – your garden. To help you transform your patio into a place of wonder, we’ve created out-of-this-world gardens from our favourite fictional locations. Our top five brings visions of the future, alien worlds and fantastic locations right to your backyard. Let’s peep through the looking-glass into what’s possible. This futuristic garden is as multi-layered as Denis Villeneuve’s Blade Runner 2049. Steps, ramps and streams are cut with machine-precision, leading to your decked-out vantage point. Here, sun loungers are for night-time and you can watch your favourite sci-fi film projected onto the hedgerows – or switch on some hologram art. 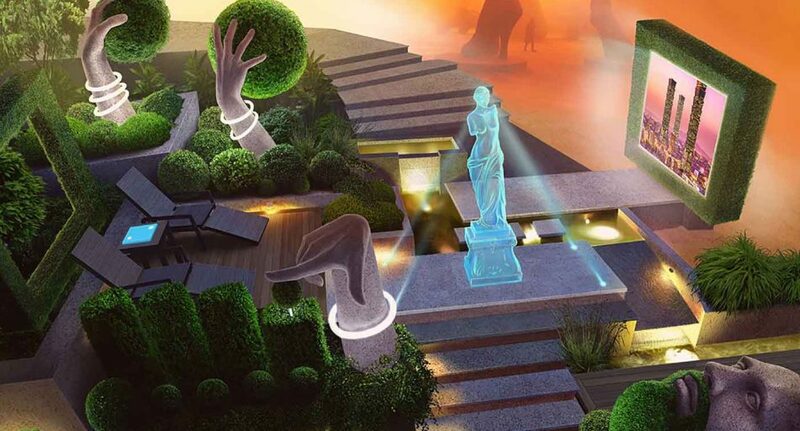 In this reboot of a Japanese garden, razor-sharp topiary recreates LA’s skyscrapers and gigantic, stone-lantern hands – with UV-light bracelets – point to the film’s Las Vegas in ruin. A stone face with shrub beard brings a fun element into this cyberpunk garden. In Star Wars, George Lucas’s characters love to escape to Naboo – you’ll remember that Anakin and Padmé court here. Our centrepiece lawn with stone fireplace and water feature pays homage to Naboo’s Lake Country. You and your other half can snuggle on a daybed big enough for Jabba the Hut to sprawl on. Got guests over? Mingle on the patio lit by bubble lamps, which glow like Gungan underwater homes. The surrounding rocks have green domes that glint like the copper roofs of Theed’s stately buildings. Why not escape the everyday with an Avatar-inspired garden? Just like James Cameron’s Pandora, light brings everything together. Bring dead tree trunks alive with fluorescent lights (we used Unobtanium crystals, but LEDs will do the job, too). The glass dining table and chairs rest around your very own Hometree, which glow with a blue tinge – just like the sociable Na’vi people. Lastly, we lifted the idea for islands of hedgerows from the floating mountains of the film’s alien world. In a letter to a friend, JRR Tolkien confided that Rivendell’s rocky landscape is inspired by hikes around Switzerland. Our garden’s cobbled path, stone planters and rock bridges continue this theme. But Peter Jackson’s epic films influenced our Rivendell garden, too. That’s why you’ll find a gazebo with Art Nouveau swirls and lamps with Celtic knots. The grand, outdoor fireplace makes this an all-season retreat – perfect for welcoming travel-weary guests. Just like Lewis Carroll’s 1865 novel, things aren’t quite what they seem in our Wonderland garden. Sunflowers open into pool loungers, toadstools double as dining tables and looming candy canes play with your sense of perspective. There’s more than a splash of Tim Burton to the pool party, too. Just look at the gothic swirls of our boat planter and colourful talking flowers, which would make Johnny Depp blush. Now that you’ve seen what’s possible, why not bring some of the character, places and themes from your favourite fictional place into your garden. Start with a plant pot and see where your imagination takes you.